Th-INK-ing of You: Happy Birthday Nathan! Today I thought I'd share a card I made for my Grandson who turns 13 on Jan 12! Where did the time go? It seems like just yesterday he was a little baby! Now he is as tall as I am! I'm so thankful for such a wonderful Grandson though... he's such a good "kid"! He truly loves the Lord and has a heart for things of God. I pray that he'll never lose that sight and that he will stay close to the Lord all his days. So as he enters his teen years... his Mom and Dad probably shudder a little, and we all joke about plugging up his ears until he's 21 so his brains don't run out one night.... (an old joke you might not have heard).... but the fact is.... he's growing into a wonderful young man. It brings me such pleasure to watch as the long days of parenting yield their fruit! Happy Birthday Nathan! We love you! A wonderful card, coloured to perfection. Thanks for joining in at Belli Challenge this week. What a COOL card--love your coloring, Grace! Happy bday to Nathan! Time does fly, doesn't it? This card is fabulous for someone his age, especially! My 2 year-old grandson turned 3 last week. We are going up to celebrate his birthday this weekend with a party. I am sure Nathan will think this is a super cool card from his super cool Grammmy! I love the bg on this card, too! 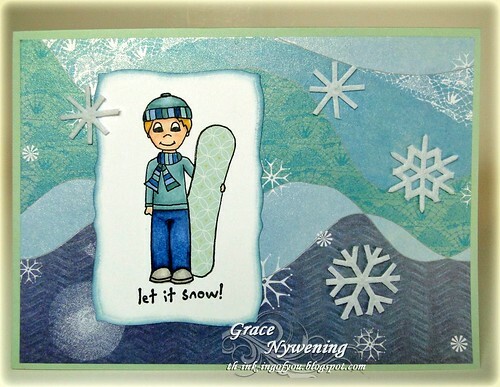 Grace, You are so talented, I really enjoy following your blog!! Your grandson will love this card!! Happy Birthday to Nathan!! I am sure he will love this card. It matches his wish perfectly!! Great job with the background and the paper piecing!! I bet if I snowboarded instead of stamping, that would help with my diet. LOL! Oh...just saw your challenges...Thanks for joining the Creative Belli snow challenge! It is perfect. Your card for your grandson is adorable, Grace! What a cute image! Love how you did the background! We were completely "iced in" here yesterday. DH spent most of the day chipping at the driveway and he did make it out to work this morning. I am waiting for him to report on the outside roads before I go out. What a winter so far! Stay warm! Hugs! Great card! Love how you have colored his jeans! Thanks for participating in the Creative Belli Challenge. that card is adorable- i think he will love it! So glad you played wiht the color chef challenge!! Oh my goodness at all the different layers...just gorgeous Grace!! Love your snowboarding card. My grandson (who is college age) is on a ski trip right now except he is snowboarding. I tried to find the stamp on line but was not successful. Can you tell me where you purchased the stamp? I am an avid follower of your blog and love everything you do. I read more carefully and see that you are not sure if the stamp is still available. So please disregard my question regarding where you purchased the stamp. :) I did try to find it on line. Maybe I will try again later. Thank you for sharing your inspirational cards. Oh Grace, he is going to love this! I have a 10 year old and always struggle with that age group. You made a winner! Great card for a 10 year old. Thanks for taking part at The Crafty Pad this week. such a cool card! thanks for playing with us at PIO! hugs!